Hillcrest Tourist Park is situated along St Helens Point on Tassie's Fabulous East Coast. The Hillcrest Tourist Park & Mini Market caters for your every need. Eight en-suite cabins accommodate families, couples etc along with powered and un-powered sites which provides ample space for vans and tents. Our one stop convenience store boasts a selection of groceries, take-away, magazines, news papers, postcards, stamps and a range of beer, wine and spirits for our In-House Guests. The fishing enthusiast shouldn’t feel left out. We stock a range of bait, lures, rods etc. We also cater for most of your vehicle and boating needs with petrol, diesel, oil, gas refills and gas exchanges available. With safe bay beaches within minutes walk and awesome surf beaches within minutes drive along with easy access to boat ramps, makes Hillcrest Tourist Park the only place to stay. 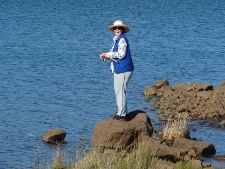 Hillcrest Holidays = Fishing & Fun. 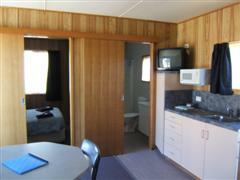 1 Bedroom Fully Self Contained Cabin. Sleeping configuration: Master bedroom contains 1 double bed. Plus double futon. Linen included. 1 Bedroom Fully Self Contained Cabin. Sleeping configuration: Master bedroom contains 1 double bed and the Living room has 2 singles. Perfect for a family consisting of 2 adults and 2 children under 16 years of age. Linen included. 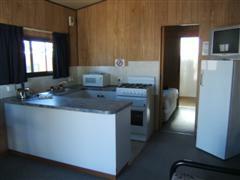 2 Bedroom Fully Self Contained Cabin. Sleeping configuration: Master bedroom contains 1 double bed and Family room has 1 double bed and 3 singles. Linen Supplied. Please note: Price displayed is per double. Extra Guests Pay $15 per person per night on arrival.